1.Take off your shoes. Especially if they are slippers or ugg boots. Barefoot is the best way to get the job done quickly, so you can hot foot it around the bed quickly and effortlessly. Shoes/slippers and especially ugg boots slow you down and are a lot more effort. 2.Remove anything hanging around your neck. That includes scarves, long necklaces, anything that can get caught when tucking in sheets. 3.If you can, play some music (that old trick). 4.Get the new sheets out first, so you see them all the time and are guilted into starting. 5.Strip off your old sheets and banish them to the laundry basket. Seriously consider changing the mattress protector (that thing needs a wash too). 6.Start with the easiest step first. For me, that's the pillows. That first step is always hard to take, so make it an easy one. There. Done. 7.If you can, pull the bed away from the wall. Don't be lazy. This will make your job 100% easier. You might consider sticking a little floor protector pad underneath each bed leg to make this easier and protect wooden floors. 8.Now for the fitted sheet (hopefully you've replaced the mattress protector. See step 5 above). This is important – start with the hardest corner first. Usually that's the corner that is against the wall and hard to reach. Then the 2nd hardest corner. Then finally, when you have to struggle and pull that fitted sheet to get those last 2 corners in, you will have lots of space and easy access. 9.Now for the flat sheet. Bed-making styles are usually personal preference, but the easiest in my opinion is to line that sheet up with the top of the bed, and then simply tuck in the end and bottom corners. 10.The extras. A doona/duvet is great for hiding imperfections and throwing on top of the bed. Then pop your pillows on top. And for a luxurious look, add another 2 pillows, and maybe a scatter cushion or 2 in contrasting colours (or 3 if you are me). And there you have it. One beautiful, freshly made bed with new sheets. Minimal pain, maximum efficiency, and hopefully, an experience you might repeat at least once a week. Enjoy! And for the doona/duvet, an easy way to put the cover on is to have the cover inside out and lay the doona on the bed. The put a hand into each of the furtherest corners of the cover, and grab the two end corners of the doona and turn right-way round with the two together. The two ends of the doona magically stay put and you get the best coverage on your own. Learnt from Suzi Carpi and now just store my doona covers inside out ready to use. Daniella - genius. I am definitely going to incorporate that tip into my routine. Thank you! 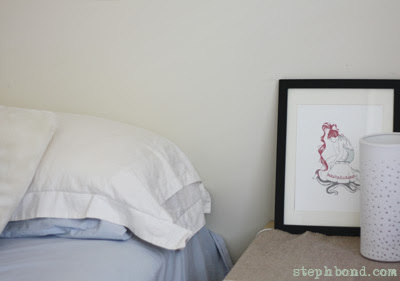 A tip I use is to keep the sheets and pillow cases together by storing them inside of the pillow cases. I do this and it means I can just grab it all out of the cupboard in one go. Brilliant Lis! I'm always hunting around for that elusive lost pillow case.